The Interface Editor can be used to define the interface, i.e. the input signals, output signals and power ports of a submodel. 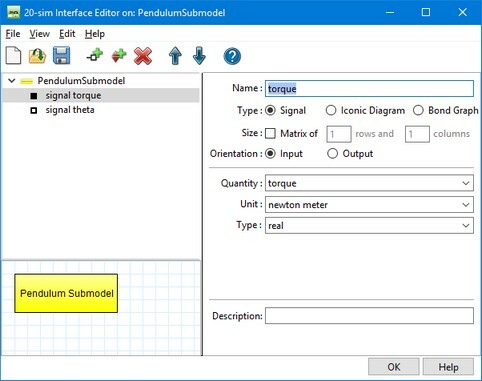 The 20-sim Interface Editor can be used to define the model interface. 1. In the Editor select the model of which you want to change the interface. 4. or at the bottom right of the Editor click the Interface tab and in the Interface tab double click. 1. Use the Edit menu to add ports to the list. 3. From the Interface Editor menu, select File and Update. 4. Close the Interface Editor. 1. Use the Move Up and Move Down buttons to order the list of ports.